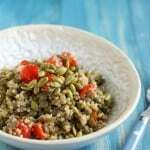 Home » Dairy Free » Spiced Lentil Quinoa Salad with Pepitas. Spiced Lentil Quinoa Salad with Pepitas. 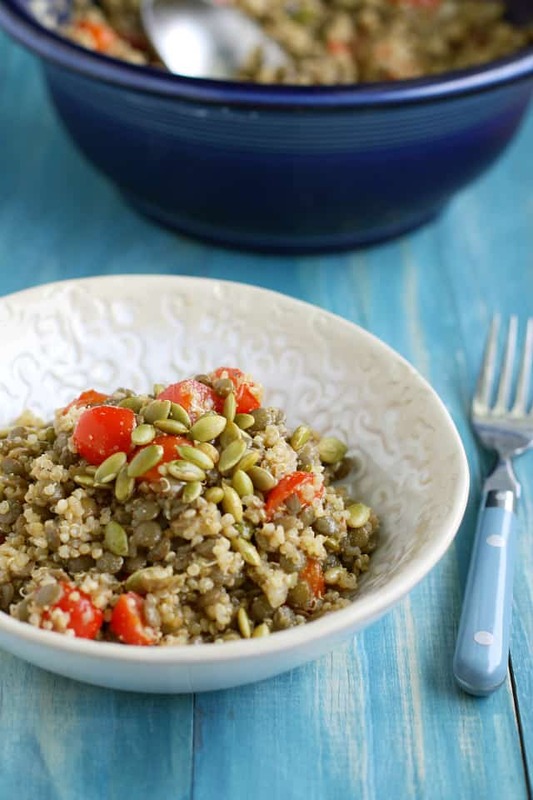 This spiced lentil quinoa salad with pepitas is a healthy summer dish that’s sure to fill you up. Gluten free, vegan, and allergy friendly. But that’s all in the past now. Hooray for a healthy end of summer! (I hope). I’m still hanging on to every last bit of summer that I can. I know that everyone is kind of thinking of apples and pumpkins and slow cooker recipes and such, but it’s too soon for me! Don’t take my summer yet! We are still eating tomatoes and corn and zucchini and will be for a while over here. I made this spiced lentil quinoa salad the other day, and it was a great way to use up the pile of cherry tomatoes we have from our garden. The cherry tomatoes are still going strong, although our other tomato plants did not fare too well this year! I don’t know why, maybe the cooler weather and too much rain? Spiced lentil quinoa salad with tomatoes and a bit of crunch from pepitas makes a great summer dish! Rinse the quinoa and place in a saucepan with two cups water and a teaspoon of olive oil. Bring to a boil, then reduce heat to low and cover, and cook for 15 minutes. Turn heat off and let sit for 5 minutes. Fluff with a fork. Put the lentils in a saucepan with enough water to cover by about one inch. Bring to a boil, then reduce heat to a simmer and cover. Cook for about 25-30 minutes, until lentils are tender but have not lost their shape. Drain and rinse with cool water. In a small bowl, whisk together the olive oil, vinegar, garlic, salt, pepper, and cumin. 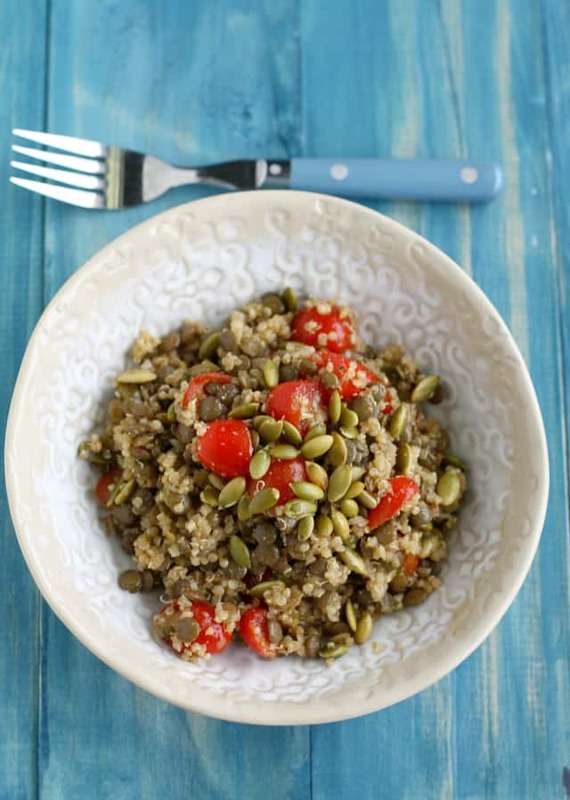 In a large bowl combine the quinoa, lentils, and tomatoes. Pour on the dressing and stir to coat. Add the pepitas and stir again. Serve warm or cold. 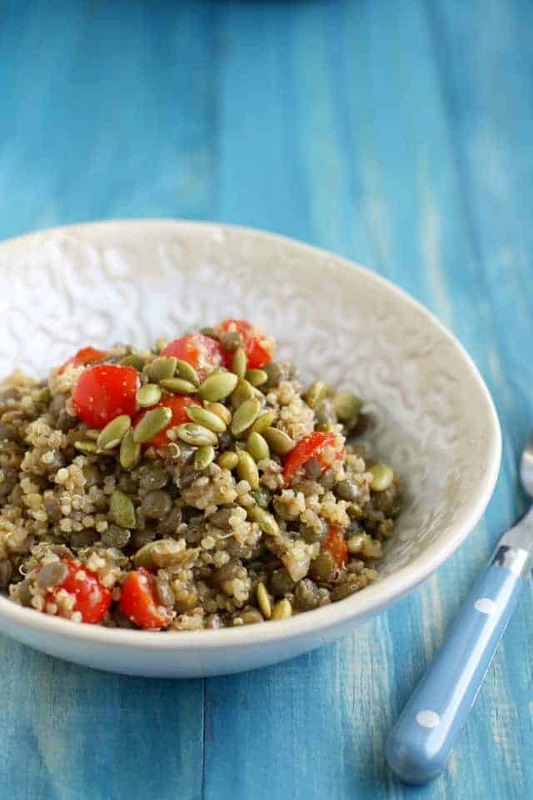 This lentil quinoa salad is really filling – the lentils and the quinoa both have a lot of protein, so it’s a nice summer meal. Make it for dinner and serve the leftovers for lunch the next day. « Some Printables and a Favorite Song. Another great tasting delicious salad recipe! I am sorry to hear the kids are sick! But glad you are getting better! This salad looks awesome with all the veggies. Glad you guys are doing better! Summer colds are the worst. This salad looks like the perfect end-summer lunch/dinner. Knowing me, I would probably sprinkle some feta on top and just call that my dinner! Pinned. This looks like a great healthy salad, and a nice mix of colors and textures! I’m glad you are all feeling better! Glad you’re all feeling better! 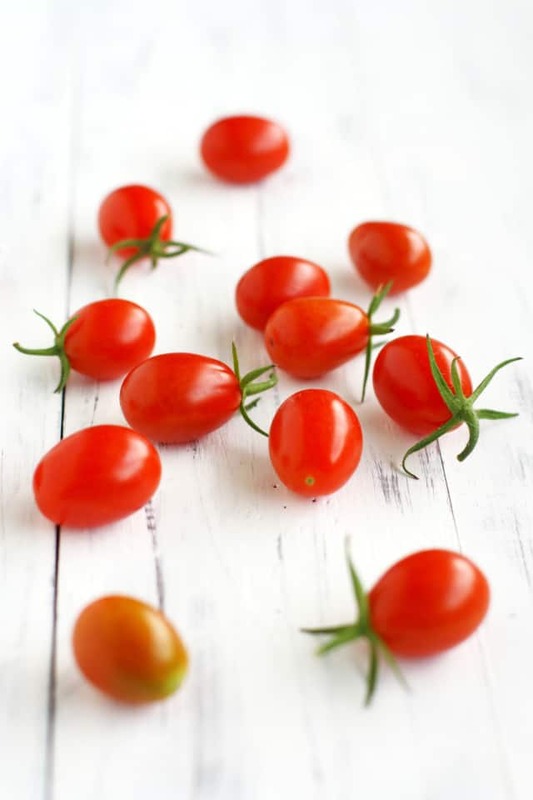 Those cherry tomatoes are beautiful. Any spiced quinoa and lentils..count me in. And pepitas too! Perfect! Erghh – I hate summer colds. I am glad everyone is feeling better. I love lentil recipes, as we eat a lot of them in the winter. Wahoo! I’m so glad to hear you’re feeling better! These bowls are the perfect transition from summer to fall – love those gorgeous ‘maters and spiced lentils make me want to cozy up. I could easily see these bowls becoming a fall favorite!! Aww, sorry to hear the kiddos are sick! I hope you guys to can enjoy the last official week of Summer. This salad looks awesome with all the veggies and nutrients. And I love the fact that your tomato plant has no clue Summer is ending! Pinned! Thanks, Allison! Actually, the “table” is just some boards that I stained and distressed. It was a fun little project. I’m glad everyone is feeling better in your house, Kelly! Summer colds are the worst.This quinoa salad looks beautiful! I love that you added pepitas in here. It’s an ingredient that I always forget about! Thank you so much, Gayle! I always forget about pepitas, too!